This is part 3 of my blog series on the 1-3-1 defense. In the first post we discussed 5 advantages of running the 1-3-1 and why we feel it gives us a competitive advantage. Part 2 looks at the key components and “musts” for the 1-3-1 to be successful. In this post we will cover the coverages, slides, and common situations when playing this defense. Player Positions – In the first diagram you can see we give names to each position in the 1-3-1. Keeper (X3) – We try to put a player that has great length and has a nose for the basketball. Often times this may be your tallest guard or a more athletic post player. The keeper’s main responsibility is to make ball reversal difficult and to “keep” the ball on one side of the floor as much as possible. The keeper should also lead your team in rebounds due to the fact they have great positioning to read the flight shots from the corners and wings. Pushers (X4 and X2) – By far the most important position in this defense due to the demands we place on them. 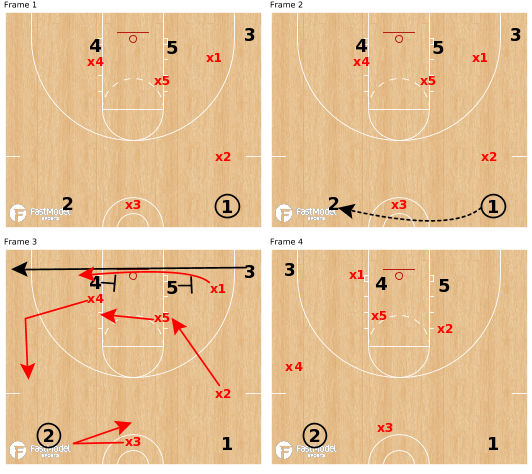 We usually put our best rebounding guard/post on the left side of the floor (X4) due to the high volume of shots taken from right side of the floor. We want our best athlete (our Michael Jordan) to be the right side pusher (X2) in our initial set up. 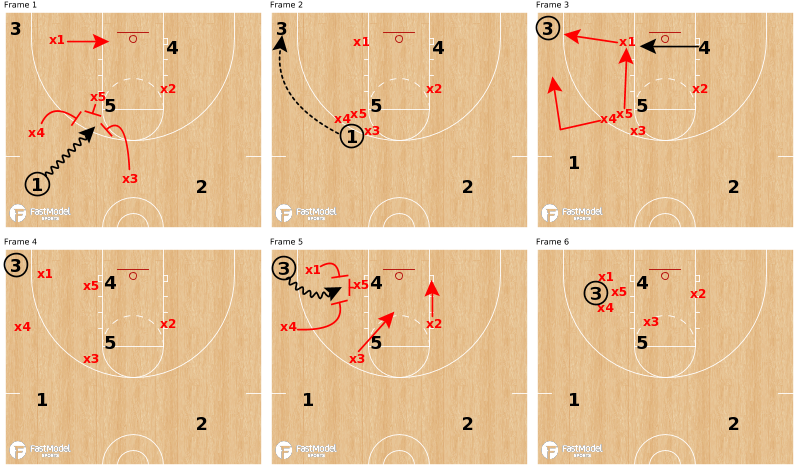 We like having an undersized guard on the right side so they can pressure the initial entry pass, possible trap the dribbler at half court, and steal skip passes from the left baseline corner. Clogger (X5) – The clogger is usually your tallest post player or a physical guard if you have a small team. The clogger must do several things well to be successful. First and most important is to keep the ball off the high post. Second, they must always have high hands to aid in distorting diagonal passes to the block area. Finally, they must attack dribble penetration at 3pt line and keep ball out of the paint. 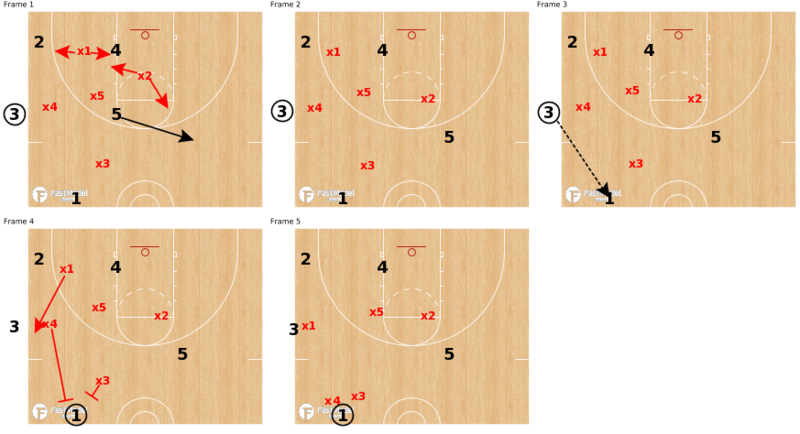 Warrior (X1) – The warrior is usually our point guard but any guard can play this position. The warrior must always be in line vertically with the basketball. They must not allow anyone to screen them or pin them in at any time. They must cover corner to corner so someone with speed, quickness and great instincts works well in this position. Before looking at coverages and slides in the 1-3-1, we must first talk about the most important concept when playing this defense or any zone defense. Our players positioning is always in relationship to where the basketball is regardless of offensive alignment. In part 1 of our player positioning, you can see the basic slides and coverages when the offense passes guard to guard. In “3” defense Player Positioning Part 2, you can see there are a couple of ways to cover the corner pass. If your team is less athletic but has some length, you may want to play passing lanes and not trap. If you have quickness and athleticism, you may want to trap more. Both coverages are shown in the diagram as well as slides after pass out of the corner. 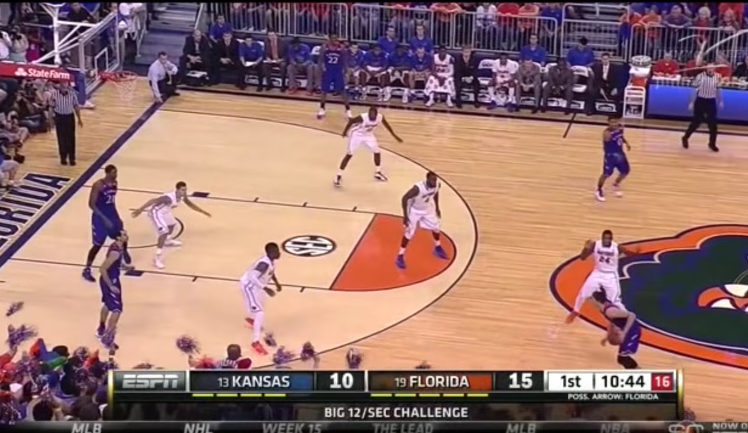 One of my favorite things about the 1-3-1 defense is its ability to keep the ball out of the paint. By having three defenders always near the ball, you can force ball handlers into what we call an umbrella trap. You can see in this diagram our coverages and adjustments based upon dribble penetration. It is very important not to foul in the umbrella trap. Fouling negates hustle! 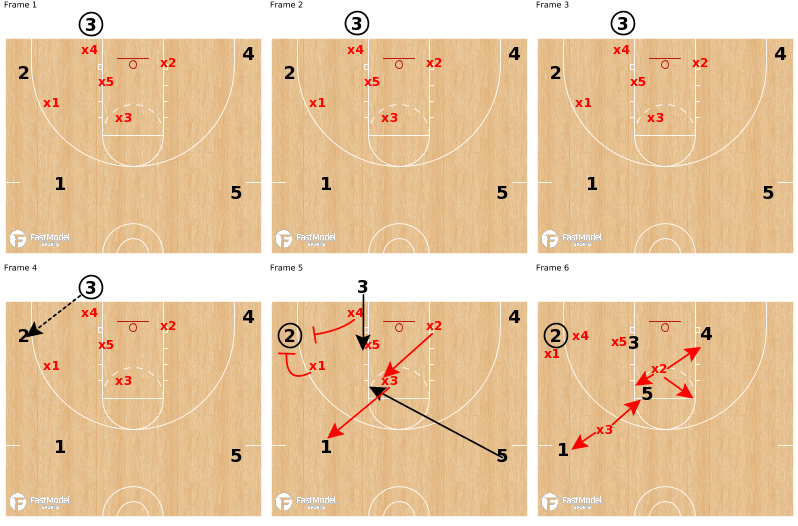 The next two diagrams look at coverages and slides against two of the most common attacks against the 1-3-1: Double Low and 1-4 High. These are unique alignments and we make small adjustments in order for us to cover these attacks successfully. 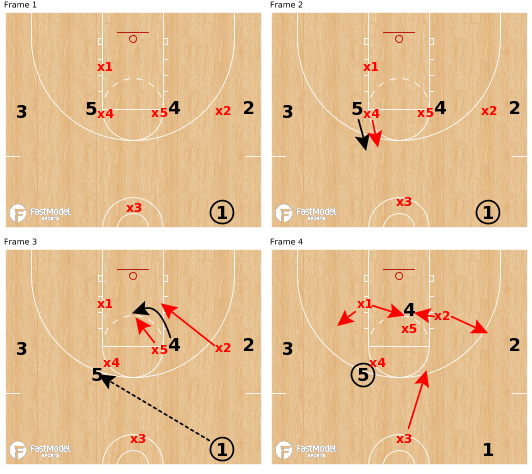 SLOB Situations – We love to use the 1-3-1 on all sideline situations, especially when the ball is below the coaches box. By putting our tallest pusher (X4) on the ball, we can funnel the ball to the corner or make the offense throw it all the way back into the back court. You can also spring a surprise trap once the ball is inbounded and possibly catch the offense off guard. Both coverages are show below. 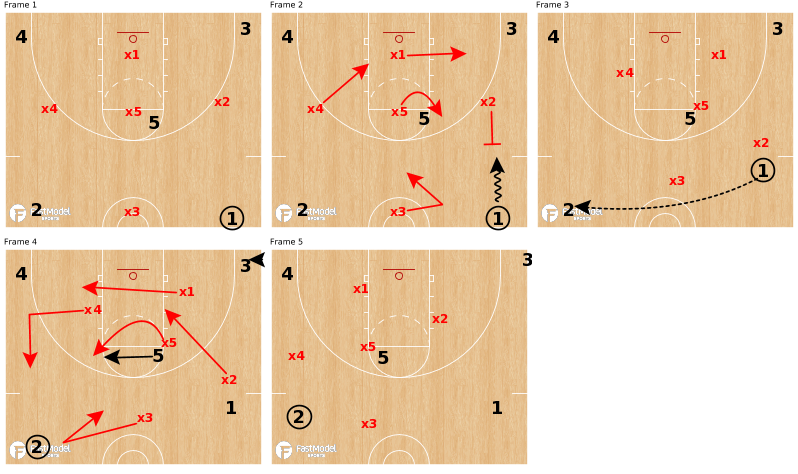 BLOB Situations -Scouting and defending baseline situations man-to-man can be extremely difficult at times. 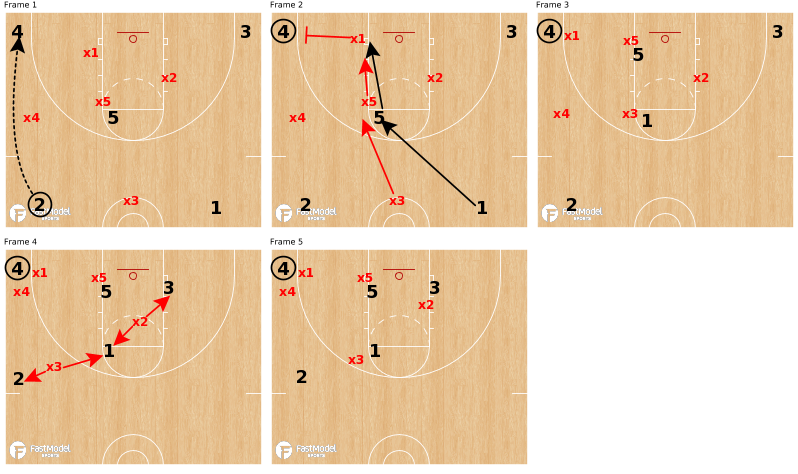 More and more NCAA teams are utilizing a “diamond” or “1-3-1” alignment to defend BLOB situations. 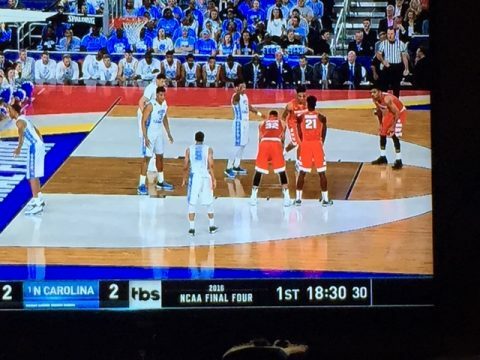 Syracuse and North Carolina both use this alignment when defending BLOB situations and teams usually just throw the ball all the way back into the back court to inbound the ball safely. In this diagram you can see how to set up the 1-3-1 or diamond alignment in BLOB situations. If you have any questions about our 1-3-1 you can contact me anytime at hamiltonr@norman.k12.ok.us or on twitter @TwolvesHoops.